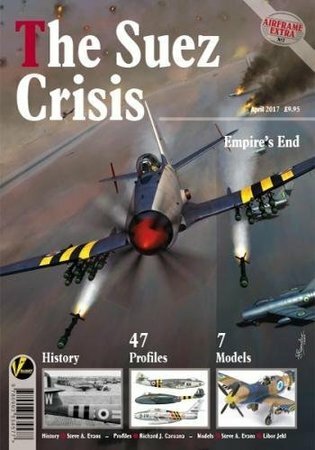 This time for the Airframe Extra series, Valiant Wings Publishing concentrates on The Suez Crisis. The Suez Crisis was when Israel, along with France and the U.K., invaded Egypt to regain Western control of the Suez Canal. Eventually all three withdrew from Egypt but not before it ended Britain's role as one of the world's major powers. This title concentrates on the air war and actually does a really good job. Sure, there are people out there that will quibble with some details but overall the title is really well written. In fact, this book is a solid reference on the Suez Crisis and a significant improvement in the Airframe Extra lineup. Naturally all models are finished to a very high level and if any of these subjects is a model you want to build, then the title is worth the price just for that. Even with that, though, the text is highly readable and a solid reference. My thanks to Valiant Wings Publishing for sending this to review.